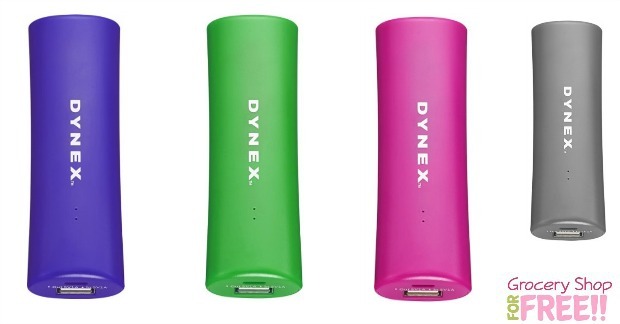 Dynex Portable Mobile Chargers Just $2.99! PLUS FREE Shipping! Down From $7.99! You are here: Home / Great Deals / Christmas Deals / Dynex Portable Mobile Chargers Just $2.99! PLUS FREE Shipping! Down From $7.99! I have many portable chargers for my mobile devices and I LOVE them! I always make sure to have at least one charged and in my purse! I never know when I might need one. There’s nothing I hate more than to have a mobile device die when I am away from home! Right now, Best Buy has a great deal on these and they would make great stocking stuffers, too! You can get these Dynex portable chargers for just $2.99 – PLUS you can have them shipped and pick them up in store for FREE! Down from $7.99! They also have FREE shipping and will arrive after Christmas. They are available in 4 fun colors, too! At this price you can get everyone one for their stocking! Keep your USB-enabled devices powered and ready for use wherever you go with this Dynex™ DX-2602 portable charger, which features a 2000 mAh lithium-ion battery and 1-amp USB port for reliable replenishment.